Officially, it was the first day of British Summer time. That meant that we’d had one hour less sleep due to the clocks changing, but it also makes you hope that you might get some clear, sunny weather. 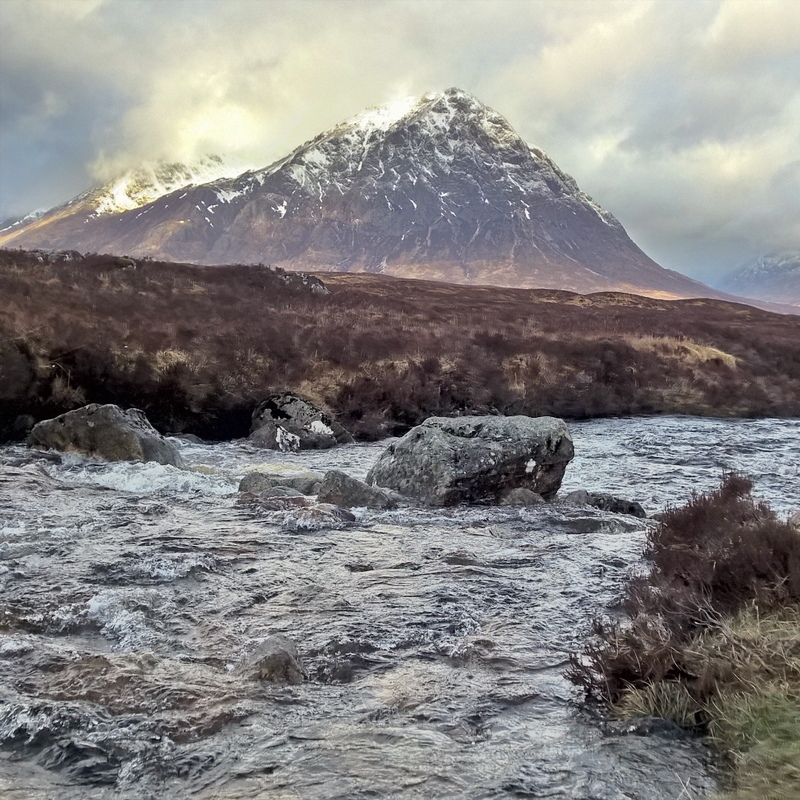 But this is Scotland, in March, on the West Highland Way. We had wind, rain, sleet, hail, snow and some sunshine. But nevertheless, it was still epic. 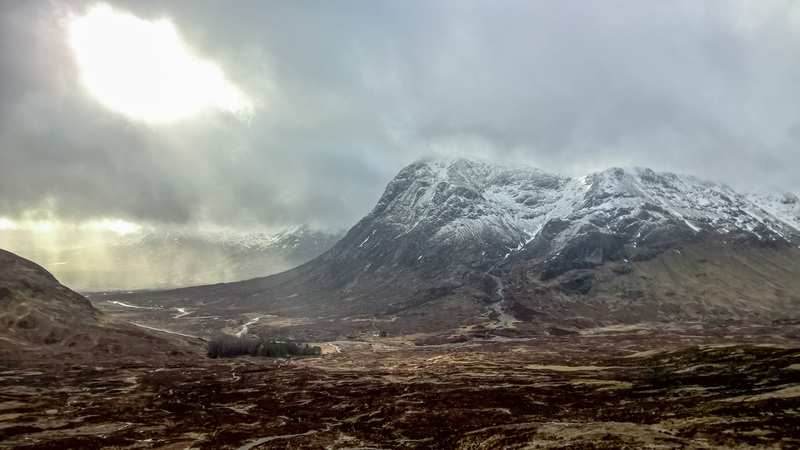 My mate, Scott, and I are both signed up to run in the West Highland Way race in June. This is some test of endurance as it is 95 miles over some of the most remote trails in the British Isles. We have both spent some time on the trail, either from the Hoka Higland Fling race or from various reasons to walk in this part of the world. But running it. The whole length. Well, that’s something entirely different. In preparation, we’ve both been increasing our mileage but we know we need to spend some time on the trail itself to train effectively. Knowing where you are and what comes next in a long race like that can make all the difference. 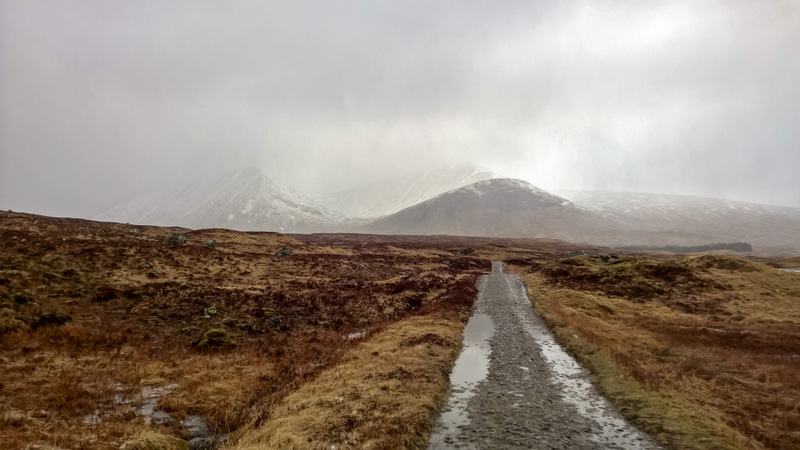 So with that in mind, we planned a long run on Easter Sunday, starting at Bridge of Orchy and running north to the top of the Devils Staircase before turning around and running back again. The whole route was expected to be just over 30 miles with about 1000m of elevation. We met up at 5am after losing that hour of sleep I mentioned and drove over to park at the Bridge of Orchy Hotel. After a quick hot drink in the hotel and a bowl of porridge, we set off. The first section is what’s affectionately known as Jelly Baby hill. It’s not much of a hill at all in comparison with some of the Munros around the area, but in the race itself it comes about 60 miles in and will be the last thing tired legs will want to climb. 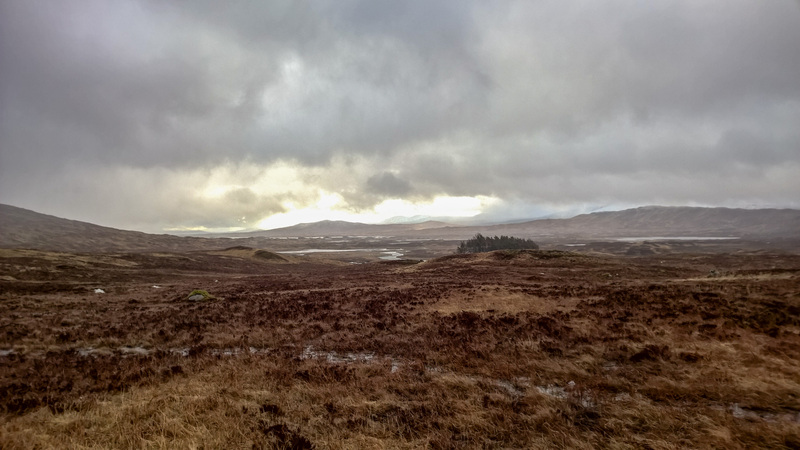 With that out of the way, the path meanders up on to Rannoch moor which is a bleak, open landscape. The WHW rises up over the moor for about 10 miles. It is one of the many old military roads built through the highlands centuries ago and they were built to stand the test of time. The surface is like a cobbled stone and whilst it looks smooth enough, after running on it for an hour or so you are happy to reach the tarmac at the road to the Glencoe ski centre. 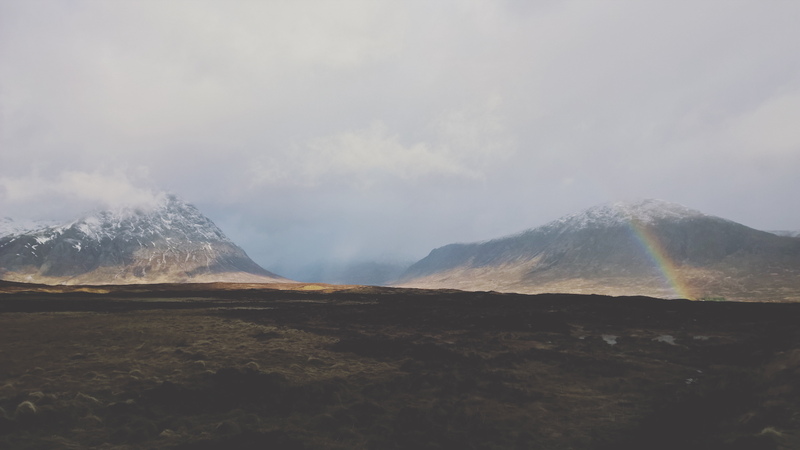 We stopped by the A82 to take in the views down Glencoe. It is probably one of the most photographed places in Scotland and with good reason. For the next couple of hours, we were spoiled with the huge scenery, which thankfully distracted from the achy legs. We reached Kingshouse in about 2h 30mins and after a quick pit stop to refill our water bottles, we headed back out for the Devils Staircase. A bit like Jelly Baby hill, the staircase isn’t actually all that much of a hill when you compare it to some of the nearby monsters which look down on it. However, after running for miles, it commands a level of respect and swiftly reminds you if you don’t show it sufficient levels. By this point the weather was starting to allow some sunshine to poke through the clouds and we were treated with some of the best views the planet has to offer for all our hard work. With the hard work done, we celebrated at the top of the staircase with a cereal bar before turning around. With 15 miles in the bag already, we were both feeling surprisingly ok, especially Scott who had already run the best part of 100 miles that week. Heading back down we had the enjoyment of passing all the people we’d ran past earlier, all of whom described us collectively as mad, insane and other similar badges of honour for any runner. We stopped at Kingshouse Hotel for a quick coffee and cake before crossing back over the road towards the ski center and the path back down Rannoch moor. Thankfully mostly downhill from here, we enjoyed the views some more until a freak hail storm blew in. Anyone who has experienced a hailstorm will know they can hurt. When you are wearing next to nothing and running in temperatures which are hovering just above zero, and the hail in question is desgined to be the pointiest, sharpest bits of hail you can imagine, they hurt even more. Combine that with about 25 miles of running by two grumpy old men, then the result is a lot of muttering and swearing. I put every piece of clothing I had with me on and I could still feel the hail biting through the thick mountain hat and waterproof jacket. Thankfully it stopped just before we reached Inveroran and we could enjoy the final climb back up Jelly Baby hill and back down into Bridge of Orchy. By the end, we’d done 32 miles in just over 6 hours. We both felt worried about what the WHW race has in store for us, but equally, we are more content now we’ve run some decent mileage on the route. We are planning another run or two on other sections before the race in June, so look out for more updates. All told though, this was a fantastic run with great company, thanks Scott! It gave me more confidence for the races ahead as my longest run otherwise had been about 20 miles. I’ve managed to get up to running about 100km a week now with a couple of longer runs mixed in so my training is going well. 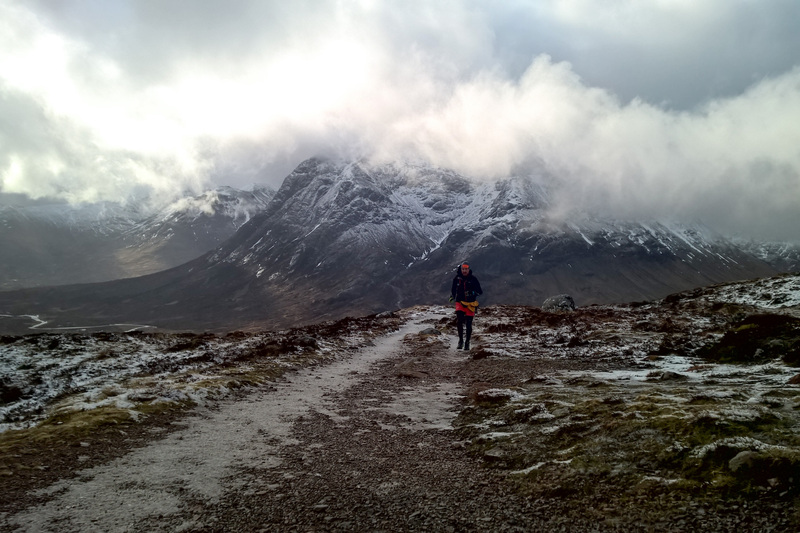 I hadn’t mentioned this before but I’m being interviewed in the run up to the West Highland Way race in the podcasts series expertly run by John Kynaston. Head over to the race website to hear the first two instalments.